A wonderful collection: poems that deliver spin, payoff, news and a distinctive angle of vision and razor-sharp stylistic edge, unmistakable from the first line laid down. These are telling poems not afraid to express strong opinions... It's obvious that he has read widely and taken inspiration from a vast store of information. He's also capable when it comes to nature writing: "Vernal Pool" is a stunner. Read him. 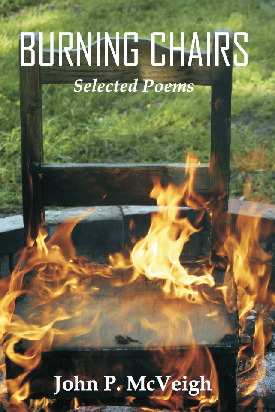 John McVeigh's poems command our attention. Filled with an uncommon wisdom, they manage to delight our senses and disrupt our complacencies. He takes on organized religion, politicians, educators and businessmen. No one is spared. His quest is to make us more vigilant in our lives, t see beyond the platitudes, and to lift the veils of deceit. Yet in tender love poems, he also evokes the great yearnings of the body. These poems will make you happy that we have poets whose hearts are true to their words. Look and see the desolation of many. And to pass them by is to hear only a hissing. How have we come to this? By greed and grabbing. Their way back because they could not know they were lost. Unto the seventh generation. Our pride will be cast down. The mighty imprisoned, but it will not put food on our plates. The captains of industry have gone, but not down with their ships. Out of the death breaths and rattles, shall come a new world. May we recreate it with justice and mercy and the sharing of bread.